The medial collateral ligament (MCL) of the elbow is situated on the inside of the elbow and helps to provide stability to the joint. Damage to this ligament can occur from a sudden traumatic injury, or from repetitive overuse, for example throwing with poor technique. Symptoms of a medial collateral ligament sprain in the elbow will depend if the injury is acute (sudden onset), or if it has developed over time. Symptoms of an acute ligament sprain will be sudden onset pain on the inside of the elbow, with rapid swelling and possible bruising developing later, particularly if the injury is severe. Chronic injuries will develop gradually over time. Pain will be felt on the inside of the elbow and there is likely to be some local swelling over the painful area. 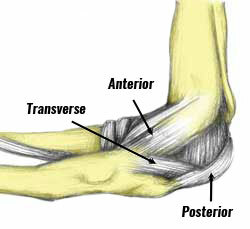 Tenderness and pain will be felt when pressing in (palpating) the area of the ligament on the inside of the elbow. Specific tests to asses the medial elbow ligaments will stress the ligament by stretching it to see if the pain is reproduced, or increased. This is done by straightening the arm then applying a sideways force to the forearm to put the ligament on the inside of the elbow on stretch. Pain may also be felt on rested elbow bending for example as in a bicep curl exercise (elbow flexion). 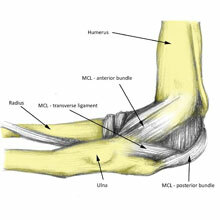 The elbow joint consists of the humerus (upper arm bone), the Ulna and Radius (forearm bones). These are connected by ligaments which join bone to bone and provide support and stability to the joint. The ligaments on the inside of the elbow are known as the medial collateral ligaments (MCL) of the elbow and consist of the anterior MCL, the transverse MCL, and the posterior MCL. Muscles produce movement by attaching to the bones via tendons. 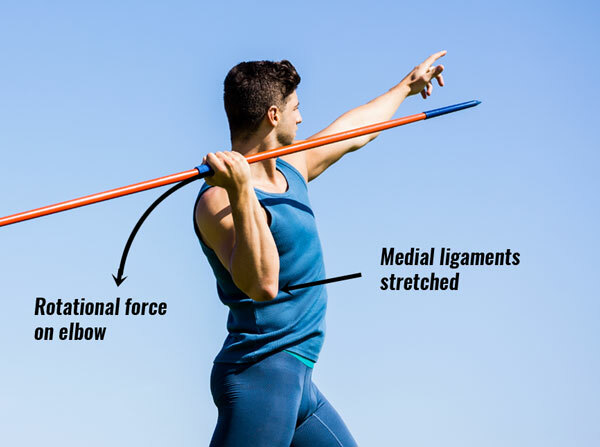 Medial elbow ligament sprains usually involve a lateral (sideways) force being applied to the forearm, placing the inside the of the joint under stress and overstretching the ligaments. 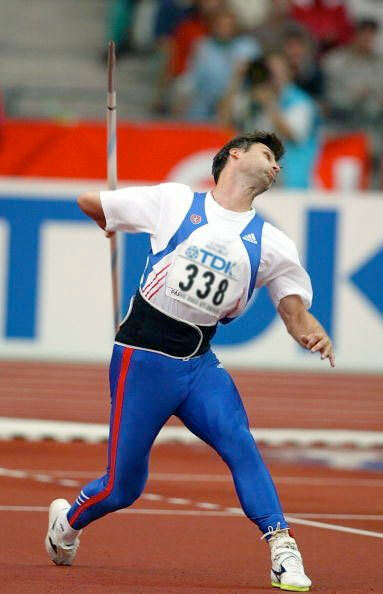 For example, throwing a heavy implement such as a Javelin with a low elbow technique causes large stress forces on the inside of the elbow. Many beginners (and even one or two elite throwers) like to throw with a ‘low elbow’ technique as the arm can store a lot of energy and propel the implement a long way initially. However, there is often a price to pay for delivering those forces and the medial elbow ligaments often pay it. Acute ligament sprains may also occur in combat sports such as Judo or Mixed Martial Arts. Overuse injuries of the MCL may also occur with repeated throwing of a lighter object such as a baseball. Over time the small repetitive forces add up and eventually the ligaments tear or stretch. Initial treatment is to apply the PRICE principles of protection, rest, ice, compression, and elevation. Rest from all activities which stress the elbow, or increase symptoms. For mild injuries, this may mean a short rest period and if caught early enough simply modifying the technique to avoid stressing the ligaments may be enough. However, for more long term chronic injuries or severe acute injuries complete rest may be necessary. Apply ice or cold therapy to reduce pain and inflammation. Do not apply ice directly to the skin as it may cause ice burn. Wrap in a wet tea towel, or use a commercially available cold therapy wrap which can apply compression to the joint as well. Compressing will help reduce swelling, support and protect the joint. Wear an elbow brace or support to protect the area from further injury whilst healing. A professional therapist may use Ultrasound therapy or other forms of electrotherapy to help relieve pain and swelling, or tape the elbow joint to protect the ligaments. Sports massage may be helpful after the acute stage, especially friction techniques to break down/realign scar tissue and increase blood flow. Surgery may be performed to reconstruct the ligaments in particularly severe cases, however, this is a very last resort as results are not often good. When pain allows mobility and strengthening exercises can begin. It is particularly important to identify causes such as poor technique and overtraining as simply returning to old habits will cause the injury to recur. If the ligaments have been overstretched causing long term joint laxity then it may be necessary to wear strong elbow support or strap the elbow to protect the medial ligaments. Sports taping will provide the most support but it does not last as the tape itself stretches slightly within a couple of hours or so depending on the kind of activities done.